What Place Does Blackface Have in Popular Culture? Fashion stuntwoman Lady Gaga is no stranger to controversial red carpet attire designed for the gossip mill, but even the provocateur pop queen’s meat gown at the recent MTV Awards couldn’t compete with the Black Eyed Peas’ Will.i.am’s wardrobe decision. 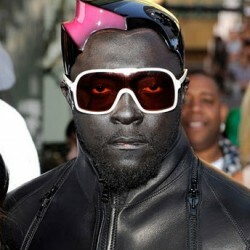 For a futuristic performance at the pre-show, Will.i.am opted to take Jay-Z’s ‘All black everything’ mantra literally, donning head-to-toe leather and painting his face black, thereby performing a kind of inverse, 21st-Century minstrelsy, and raising the question: Is it possible to sever blackface from its hate-filled history? After picking up practically every award for her supporting role in “Precious: Based on the Novel ‘Push’ by Sapphire,” it was a safe bet that Mo’Nique would win the Oscar. She is the fifth Black actress to win an Academy Award. Nevertheless, there are many of us who consider Mo’Nique’s Oscar win to be just another “negative” role earning recognition. Filed under: Film, People, POV.